← Guess What! Cover of Publishers Weekly! 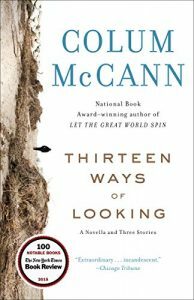 The opening stanzas of “Thirteen Ways of Looking,” Colum McCann’s first story from his collection of the same name, will charm the bejeezus out of you. The first of the thirteen stanzas (I choose the word because there is something musical about the way he spins his yarn–including the three lines of poetry about blackbirds that head each segment) features the view from a video camera. The descriptions of the apartment house bedroom it sees are simple, exact, and very beautiful. Several of the succeeding twelve parts of the story feature video-camera views as well: from the elevators, from the lobby, outside the major character’s Upper East Side building, on the corner of the street where he proceeds to lunch, on the opposite corner, and even immediately outside the restaurant where he eats. So what’s charming about the view from a video camera? you may ask. Well, the charm comes not from that particular device but from the beautifully thought-out strokes by which McCann makes his major character endearing and memorable. The occupant of the apartment that the camera is focused on is a New York City judge, retired and of very advanced age, who requires considerable help from his live-in nurse and housekeeper, Sally, to get up, get dressed, get about, and simply make it through the day. Is that depressing? Not really! We first meet the judge lying in bed, musing about his long life, and the way Mr. McCann has chosen to reveal the soul of this aging attorney will, if you’re like me, impart an almost irresistible upward tug to the corners of your mouth. But—surprise!—what McCann has constructed here, in this stunning first story, is a murder mystery, in which the judge is the victim. Those camera videotapes become the tools of law enforcement, perused repeatedly and doggedly by detectives, in an effort to solve the crime. As it turns out, the tapes do open the means to solving the murder. Meanwhile, however, the story shimmers with other details which describe, in ways that etch themselves into your mind, a life that is, like most lives, both ordinary and extraordinary at the same time. There are the random carnal thoughts and the conversations that show respect and fellow-feeling—of a caregiver, of a waitress, of a restaurant owner. There are revelations about how much the judge misses his left-y daughter, the continuing reminiscences about his wife, and the conflict forged from a painful yet unbridgeable gulf between the judge and his wealthy turd of a son. And all the while, the suspense, false directions, and uncertainty appropriate to a murder mystery. Meanwhile, along the way, the author has some beautiful things to say about writing, particularly poetry. Taken altogether, this story is a tour de force that no one who loves fiction should miss. But wait! That’s not all! There are three more terrific stories—all more traditional narratives—included here. And one, “Treaty,” which anchors the collection, ranks among the best of the short stories in my particular memory bank. An altogether stellar collection. This entry was posted in On Books, On Writing, Publications, Videos, Whatever and tagged Colum McCann, judge, murder mystery, musical, poetry, thirteen, unbridgeable gulf, video cameras. Bookmark the permalink.